Students, Faculty, and Community members are all welcome to attend. New Medical Building Grande Corridor, 15 Arch St. Many of our greatest medical technologies and advancements have come out of times of crisis. Come and peruse a sampling of century-old artifacts from both the Spanish Flu and WWI. Curated by the Museum of Healthcare. 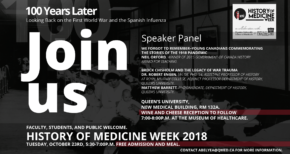 Award-winning Neil Orford will discuss the Spanish Flu and its impact in medicine. In 2017, Neil Orford retired from teaching History at Centre Dufferin District High School in Shelburne, ON. His work as a teacher has seen him win numerous awards for his teaching, most recently the 2015 Government of Canada History Award for Teaching; as well as the prestigious 2013 Canadian Governor General’s Award for History Teaching and the 2012 Ontario Premier’s Award for Teaching Excellence. In July 2013, Neil Orford founded a consulting business, Canadian Historical Educational Services, Ltd. to assist school boards, museums, non-profits & government agencies with designing educational programs for historical thinking and commemoration. This work has led him to consultation work with the Federal Ministry of Canadian Heritage in 2017, helping to design digital commemorations for students across Canada. Dr. Robert Engen, MA’08, PhD’14 (History) is an assistant professor of history at Royal Military College and an adjunct professor in the Department of History at Queen’s. He is the author of Canadians Under Fire: Infantry Effectiveness in the Second World War and Strangers in Arms: Combat Motivation in the Canadian Army, 1943–1945, both published by McGill-Queen’s University Press. Matthew Barrett is an SSHRC-funded PhD candidate in the Department of History at Queen’s. His doctoral research examines the concepts of honour and dishonour within military culture. In particular, he studies the dismissal and cashiering of Canadian officers during both World Wars. Additional research focuses on Canadian public and institutional attitudes toward suicide in the military. His academic work has appeared in Canadian Military Journal, Canadian Military History, Journal of Canadian Studies and British Journal of Canadian Studies. He has also illustrated two First World War graphic novels with Robert Engen. The Grad Club, 162 Barrie St.
Impress your friends with your history know-how during a historically themed Trivia Night! Snacks will be provided! Grande Corridor, New Medical Building, 15 Arch St. Hero or Villain? You be the judge! Wander through the Grand Corridor of the New Medical Building and enjoy the showcase curated by the Museum of Healthcare. At your leisure, take a look at artifacts of some of history’s biggest medical heroes and villains. 132A, New Medical Building, 15 Arch St.
Don’t miss out on our most controversial event of the week! 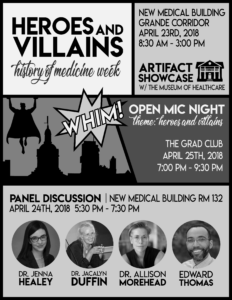 After a half hour period to gather refreshments and FREE food, a panel, moderated by the incredible Dr. Jenna Healey, resident Queen’s Hannah Chair of the History of Medicine, will question the basis for a designation of hero or villain. 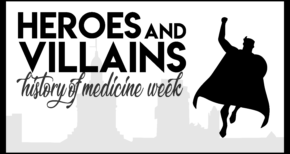 The panel will begin with Dr. Jaclyn Duffin, haematologist, historian, and past Hannah Chair of the History of Medicine, describing why and how she invented the Heroes and Villains project as an introduction both to history in medicine and to information literacy — with some of its triumphs and disasters. Next, Dr. Allison Morehead, Associate Professor and Graduate Coordinator of Art History at Queen’s University, will talk about Florence Nightingale and the “incursion” of women into the “fraternity” of medicine in the 19th and 20th centuries, as well as the ways in which historical accounts of Nightingale heroicize (or angelicize!) her to the exclusion of other figures in the history of nursing, such as Mary Seacole. Closing the panel is Edward Thomas, PhD candidate in Cultural Studies at Queen’s, will discuss his research examining Queen’s barring of black medical students between 1918 and 1964 in regards to how institutional narratives shape organizational memory and culture. Need an outlet for your historical arguments? Ready to re-enact your heroes and villain assignment? Want some free beer and endless historical entertainment? Come out to the Heroes & Villains: Open Mic Night! A relaxing event, some fantastic entertainment, and a wonderful evening spent with your Queen’s peers, what more can you ask for?! 032A, New Medical Building, 15 Arch St.
Don’t miss out on this weeks closing event! We will be screening the film “The History of KPH” by Queen’s Film Studies’ own Janice Belanger. Come to learn more about the Kingston Psychiatric Hospital, and have a relaxing end to this jam-packed week!